PR and communications professionals have been monitoring the media for mentions of their brand for years. Even before the days of digital, there were sophisticated efforts to curate news clippings from across the world. “Clipping services” would literally clip articles out of newspapers for brands to use. But with the digital transformation of the media industry, there is now an endless trail of content for comms pros to monitor and report to their key stakeholders. Gathering metrics, analyzing the data, tracking against competitors and measuring against business objectives can be more than a full-time job. That’s where a new age of media monitoring solutions can help. But just as there are many different channels to monitor, there are many different solutions to choose from, and they vary widely in what they offer. Before choosing a technology or service, it’s essential to have a clear idea of what your company’s monitoring needs are as part of an overall communications program. While features can be tempting, the depth and sophistication of your monitoring solution may matter more – ensuring you never miss a piece of relevant content. This guide will help you learn how to choose the media monitoring solution that works best for your organization. Q1. What is Media Monitoring? Media Monitoring is the process of reading, watching, or listening to media source content and utilizing the aggregate information to identify and analyze articles that contain specific keywords or topics on a continuous basis. PR and communications professionals can now monitor for print, broadcast, online and social content. They can set up detailed searches (or have a software or service do it for them) to monitor for brand keywords, topics and even for competitors and their influence. PR pros can also measure marketplace sentiment about their brand, product or services, and understand whether their mentions are positive, negative or neutral. In this section, we’ll cover the main channels that brands should be monitoring, and introduce Boolean, the type of search that enables PR and comms teams to use terms and keywords to get the most relevant results. The growth of digital media and the ability to search content online gave media monitoring the opportunity to innovate from traditional media clipping services into software-based processes that aggregate and review online news sources. Most of the well-established online news monitoring services now deploy specialized software called web crawlers. These web crawlers systematically compile the text of online news sources and index all the words in those articles and postings. Once the software has compiled the content, it identifies all news articles containing each client’s Boolean search terms (keywords or phrases) and then automatically pulls out and delivers the relevant articles to each client. Unlike human readers in old-fashioned press clipping services, software seldom misses valid articles because it reads the entire article word for word. Online media monitoring services offer multiple advantages when compared to old-fashioned clipping services or in-house media monitoring by staff. Today, an excellent media monitoring service can monitor news media sources in all countries in virtually all languages. For both mid-sized and enterprise companies, it’s important to enable customers to specify countries, languages and publications for monitoring, while also allowing software-based translations of foreign language news snippets, offered in near real-time delivery. While often a more manual process than scraping text on digital articles, broadcast and radio news remain vital sources for monitoring. They are best monitored through closed caption feeds or full audio/video recordings. This is done by monitoring the closed caption text and the audio/video of news programs on national broadcast networks and local broadcast stations across global markets. Most every major city also has a local broadcast monitor that records local news broadcasts. Most broadcast monitoring services offer streaming audio/video versions of news programs. Networks and stations also sometimes convert the live news program into online articles that they post on their websites that can be found via online monitoring services. It’s important to note that this is not always the case, so online monitoring will not always capture broadcast mentions with 100 percent accuracy. It’s also important to note that writing the closed captioning script is often a human process. Thus, there is a room for error. Consider if your monitoring strings are set up for commonly misspelled keywords; it is an important thing to keep in mind if you’re consistently missing coverage. TV and radio mentions can propel your brand visibility to millions of audiences. Ensuring you aren’t missing these opportunities, and more importantly, keeping tabs on competitors who may be garnering this visibility is essential to stay ahead. Social media represents the pinnacle of change in the digital monitoring space. The internet has empowered individuals to make their voices heard, and ultimately have a business impact on what others think of your company or brand. Tracking what consumers and other organizations are saying on social media has become an imperative. In addition to monitoring the major social networking sites such as Facebook, Instagram and Twitter, monitoring for word-of-mouth content remains vital on blogs and micro-blogs, review sites, forums and video sharing sites like YouTube. It’s best to monitor all the different types of social media as widely as possible since it’s close to impossible to predict where or when vital market intelligence will appear or where it will be repeated. It’s important to be able to differentiate between “social media management” and “social listening” in these cases. There are a lot of vendors that provide social media management functions with a focus on posting and engaging, rather than monitoring. Services like Buffer and HootSuite allow users to post from multiple social handles at once and track engagement, but don’t provide listening tools across blogs, forums and social media channels outside of owned ones. If this is something your company needs, these are fantastic tools to incorporate. However, they do not provide a complete social monitoring solution, which is an important distinction. Those tools are only for publishing. Many of the more advanced news monitoring services also provide integrated social media monitoring with the communications and PR professional in mind. Cision Social Media Monitoring, for instance, offers comprehensive daily coverage of blogs, message boards, forums, review sites and social networking channels like Facebook, YouTube, Instagram and Twitter. This is in addition to monitoring online and broadcast coverage — ensuring that you have a holistic view of the news that matters most. While press clipping services have been overshadowed as digital media has taken over, monitoring for print publications still makes up a significant segment of the media monitoring landscape. Free tools on the internet will not cover all of these mentions. Specific mentions in publications like national or local community newspapers, consumer magazines, or niche trade publications can’t always be found online. Missing a critical mention through one of these mediums can still have a significant impact on your industry and even your brand. Other print publications include newsletters, business journals, college/alumni publications and international papers. Cision’s print monitoring capabilities enable coverage for over 17,000 print publications through various global and national partnerships. Cision can provide digital context for print publications, ensuring that the print text from newspapers, trade journals, magazines and more are directly available within the Cision Comms Cloud™ for users to view in with the rest of their digital content in one place. As earned media becomes increasingly visual, the image-based content that communicators use to tell their story becomes even more valuable. Conventional monitoring methods rely on text and hashtag capture to track images and logos. But because the bulk of internet-based images are not associated with text or hashtags, conventional systems lack the ability to truly track and measure the impact of visual content. Through proprietary ImageIQ technology, Cision enables communicators to measure the history of an image or logo and its path forward. Data on reach, engagement and audience of a brand image, as well as influencer insights, can be leveraged to create and adjust communications strategies. Those who rely on text (or text-based monitoring) are missing this key component that completes a brand’s comprehensive view of earned media’s impact on the business. Q2. Why Do You Need Media Monitoring? Once you grasp the basics of media monitoring and the different types of monitoring your brand should consider, it’s important to understand the impact that media monitoring can have on your communications efforts. You can assess your media monitoring requirements by understanding how successful companies use media monitoring services and how you could incorporate similar strategies. For example, The Stroke Association, the U.K.’s leading stroke charity, turned to Cision analysis to aid in optimizing PR outreach and monitored awareness of stroke among the general public. Cision was able to show that although 48 percent of U.K. adults were reached by their content and messaging, only 14 percent had been exposed to coverage featuring a link to the website. Following this feedback, the Stroke Association adjusted its activity and managed to increase the coverage featuring the website link which doubled its original results. With technology at the level that it is at now, ignorance is no excuse for any communications team. You need to be monitoring everything, all the time, that pertains to your brand, product or service. If a new competitor, product, or event happens that can potentially disrupt your industry, the last thing you need is your boss coming into your office referencing a news article that you had no idea about. No one likes a crisis, but robust monitoring helps you become more adept at handling one. Your team should be poised to quickly identify and remediate PR issues, negative sentiment or potential pitfalls that could be brewing about your company, product or industry. The right media monitoring solution empowers a company to stay ahead of these events and make sure the proper protocols are in place. The ability to identify a crisis before it takes place is the equivalent of having home insurance before an earthquake. Alerts that you can configure will help communications teams avoid and quickly diffuse crisis situations. It also acts as a barometer to help gauge real-time sentiment showing how people are responding to advertising and content marketing campaigns. Comms must be able to acquire and understand market research quickly to fuel content and campaigns that take advantage of emerging trends and therefore will more likely resonate with audiences. Executing a campaign pitch, product launch, or new initiative is only the first step in the communications cycle. Effectively tracking efforts and making the right mid-campaign adjustments to messaging and content is imperative to overall success. The right media monitoring solution enables your team to continuously track critical mentions, competitor reactions and overall audience engagement in an automated fashion that allows your teams to focus on the bigger picture. Does your company distribute press releases on prominent events? Or reach out to local or national influencers to help boost campaign visibility? Complimenting your outreach strategies with an all-encompassing media monitoring solution can help your team further understand which messages resonate best with your audiences and influencers. Additionally, using this information to pinpoint the most influential individuals can help you make better decisions on journalist outreach. Furthermore, this type of understanding establishes the groundwork for future content and helps contribute to your content calendar planning for the year. Q3. Why Pay For it? Smaller companies and organizations may initially be skeptical about going with a paid vendor, considering that there are some free services out there that provide automated news alerts and so-called ‘media monitoring.’ Google Alerts is a typical example. While a free tool like Google Alerts is an excellent intro to monitoring the media for smaller, less critical topics, it is essential to understand that it is not a tool that can be relied upon to catch news mentions of key issues and messages with consistency or accuracy. With Google Alerts, you are only receiving news from a limited number of online publications, leaving you with only a fraction the information that is taking place around your key alerts. Leaving critical gaps in coverage can have a big impact on crisis planning or campaign monitoring. Free tools like Google Alerts merely notify you of mentions, which doesn’t help drive any action as standalone points. Media monitoring should act as a medium to help identify trending topics over time through charts and graphs, categorize mentions by sentiment and benchmark and visualize data points to give your team a clear idea of what is working, what isn’t, and what needs to be prioritized. Gathering more granular metrics is something only achievable by more sophisticated media monitoring solutions. Understanding website traffic, leads and revenue generated, as well as demographic and firmographic data can help your team dig deep into your earned coverage. This information goes a step beyond most media monitoring vendors and starts to bridge the gap between the PR and communications space to marketing metrics that are measurable across your organization. Companies like Cision have made a point to invest in technologies that further enhance the detailed insights that can be gained from media monitoring. Are you ready for a specialized tool? Have you out-grown Google Alerts? What google misses? Media monitoring solutions like Cision can help you weigh the importance of discussions happening about your brand. So, you have decided that more emphasis on media monitoring is an initiative you are going commit to this year? Great! The first thing you should do is consider what success looks like for your business. 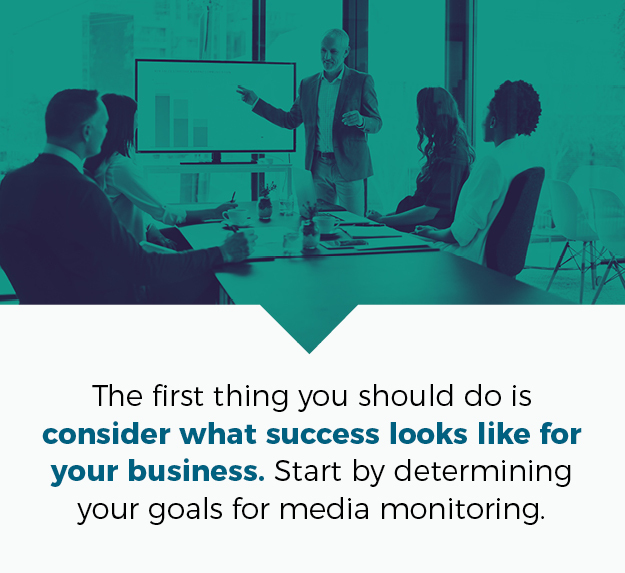 Start by determining your goals for media monitoring. Ask internal stakeholders for their input. For example, are you seeking to save your team time? Generate new earned media opportunities? Gather more market intelligence? Do you want to capture every mention or merely understand trends and tone? Do you want your team to communicate more efficiently and stay on message? Do you want to gain a competitive advantage? Are there specific influencers or publications you’d like to track? Or do you want it all? Who are your target audiences and where are they talking about you? Who are your company’s supporters and critics? Who are your competitors and what are they saying in the marketplace? Who are the journalists and bloggers that are talking about you? Who is covering your senior leaders and how are they being viewed and discussed in the media? Who in your company will be monitoring coverage and conversations using the platform? Who will be viewing the reports? What metrics are important to you and your stakeholders? What are the different media types you want to monitor? What are the primary media outlets that are important to you? What is your crisis communications plan? What regions do you need to cover and in which languages? What are your requirements today? What are your needs long-term? What type of training will your team need? When throughout the day is monitoring most important? When would you need alerts of mentions? When will you be generating reports? When do you expect your breaking news to become visible on your platform? When do you expect to be trained on the platform? When do you expect the platform to be ready for use post-sale? Where will you access the media monitoring platform most often? Where do you need this data to be shared? Where would you like to see all of your data? Do you need an integrated platform? Where can I get help from customer service if needed? How important is post-sale customer support? How important is budget vs. performance value? How comprehensive is our requirement to justify the cost? How do you share results with senior management? How do you keep your organization on message? How does your team react to a crisis? Will you need multiple people to access the platform? How is your team measuring ROI on campaigns and programs? It’s important to have a clear idea of what you need before you get too far into the buying process— and well before you reach out to vendors for demos and presentations of media monitoring platforms. Otherwise, you may focus on flashy features that don’t meet your needs, instead of the tools and content that will help you reach your goals. Now that you’ve performed your internal “monitoring audit” and you have a couple of services in mind, make sure you’re asking your potential vendors the right questions. If you don’t ask, you won’t get what you ultimately need. So be thorough with your questioning process. You want to make sure the service you choose will perform in the ways you want and need. You’ll want to base your evaluation of the service on three key areas: content, functionality and reliability. Translate your answers from above to establish the criteria for these four areas. What kind of content do they cover and collect? Social, print, television, radio, online news, blogs, etc. How is the content displayed on the platform? What metrics are provided with content? Will there be dedicated personnel assisting with my search string setup? Can you manually add filters to remove the noise of unwanted content? Does your content aggregate across multiple countries/regions? Does it cover different languages if required? Which outlets are monitored? Does the service cover the publications that are the most important to your firm? Can you cross check these? Is the content licensed for sharing? Can I add content from other sources my organization subscribes to, e.g., an industry newsfeed? Can I monitor archived content and how far back can I search? How user-friendly is the platform? How many search terms does it include? How advanced is the functionality when creating search strings? Will my team need to be Boolean search experts? Will you provide one? How accurate are the results? Am I going to miss mentions? How easy is it to organize, save and manage the content for future use (e.g., quarterly reports)? Can I address other business and communications needs within the platform, outside of monitoring, e.g., building media lists, engaging with key influencers or distributing content? How quickly can I generate my own reports? Can I customize the look and feel of the interface, e.g., personalized dashboards or branded reports? What are other customers saying about the platform? What are other customers saying about support? What are their hours of support? Is it 24/7, or during business hours? What’s the typical turn-around time for support to get back to clients? How do clients get help using the platform? What’s the standard onboarding process? What kinds of support do they offer? On-site? Full-training? Tutorials? Resource Center? Can I have support perform ongoing or on-demand monitoring and in-depth reporting on custom projects? How much will that cost? After your preparation and research, it’s time to contact a few vendors for more information and a demo of their media monitoring solutions. What should you expect so that you can truly assess whether the platform will meet your requirements and organizational goals? The vendor should ask questions to identify your core business needs and evaluate the context in which your company might use the platform. The vendor should make sure a mix of media monitoring users, buyers and stakeholders are represented in the session. Using this information, the vendor will prepare a demonstration to show how the solution provides relevant metrics and satisfies your requirements. During the demo, you’ll get a chance to see how the platform performs and will be shown all of the bells and whistles — and how the solution answers all of your questions. The vendor may also provide you with some sample reports that you can share with your internal stakeholders. You’re taking your media monitoring management program to the next level. But before you sign on the dotted line, make sure you’re evaluating the providers from all angles. There are many things to consider when it comes to choosing a media monitoring solution that best fits your business needs. You just need to ask the right questions. Enter the Cision Comms Cloud the only fully integrated communications platform that takes your PR and communications campaigns from pitch to placement to attribution. As stated, there are many media monitoring providers out there, but none that can provide as much meaning behind media monitoring as the Cision Communications Cloud. Integrated monitoring for all four core areas: online, broadcast/radio, social media and print. Overall data and content quality. Ways to customize charts and graphs. Simple, clean look and feel of a platform. Onboarding and professional services setup of Boolean searches that uniquely benefit your brand’s goals. Through acquisitions and partnerships and a strong software development team, Cision has ensured that its impact within the PR and comms industry continues to grow with investments in features and functionality that continue to set it apart from the competition. Whether you are looking for a basic media monitoring solution, or an integrated communications platform to house all your workflows from monitoring to campaign creation, to distribution, measurement and attribution — Cision has the tools and analysts to grow with your company as your needs expand. Here is a comparison of competitors Meltwater, and Agility. While Meltwater does monitor for the four main media types (Online, Print, Social, Broadcast), it is important to understand that access to data and utilization of data can be the difference between stellar reporting and missed coverage and frustration. Meltwater is well known in the industry to sell a “flashy” demo at an “unbeatable” price, but once locked into a contract, clients don’t see the level of professional services support or initial setup implementation that is required to effectively launch and maintain media monitoring campaigns with Boolean searches. For more sophisticated users, the basic graphs, charts and customization present limiting factors prohibiting them from genuinely illustrating the data stories they want to tell. Agility has recently developed a newer monitoring service to keep up with leading media monitoring vendors like Cision. Because they are in the software development stage, some of their content distribution partnerships are still being developed. Social, broadcast, and print mediums are limited to their content archives and level of detail in how they can show their analytics don’t go much beyond basic measurements. Are you ready to see a robust media monitoring solution in action? Schedule a demo of Cision Media Monitoring today.